"Family run, friendly and accommodating staff, english-speaki..."
Have a question for Green and Blue Hotel? 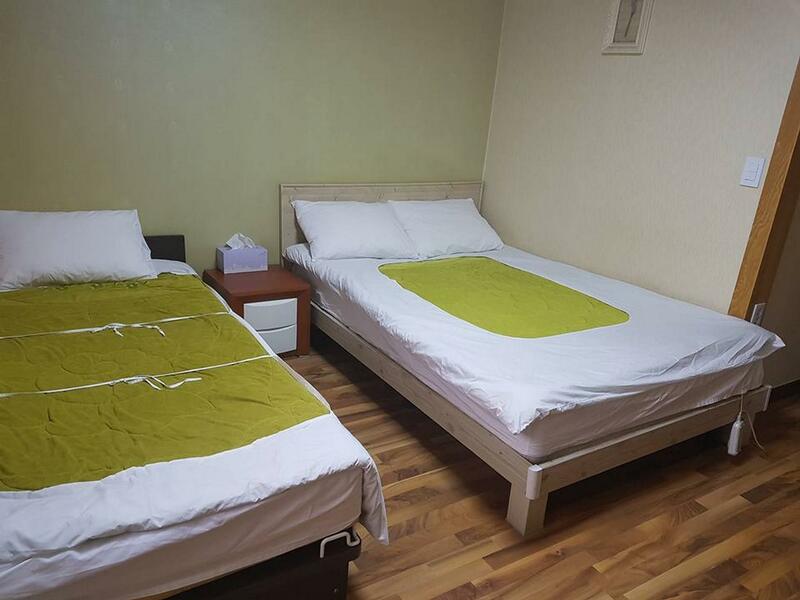 "Like our younger boy commended, it was the most comfortable stay of all hotels during our S Korea trip!" "Our room was quiet, clean, warm, private bath, and cleaned daily/fresh linens." "It was a short but very pleasant, and hospitable stay." "Nice owner, very good communication in English." For travelers who want to take in the sights and sounds of Pyeongchang-gun, Green and Blue Hotel is the perfect choice. Set from the excitement of the city, this 3-star hotel commands an excellent location and provides access to the city's biggest attractions. With its convenient location, the hotel offers easy access to the city's must-see destinations. Take advantage of a wealth of unrivaled services and amenities at this Pyeongchang-gun hotel. The hotel provides free Wi-Fi in all rooms, express check-in/check-out, luggage storage, Wi-Fi in public areas, car park to ensure our guests the greatest comfort. All guest accommodations feature thoughtful amenities to ensure an unparalleled sense of comfort. The hotel offers many unique recreational opportunities such as hiking trails, ski equipment rentals, ski lessons, golf course (within 3 km), skiing. 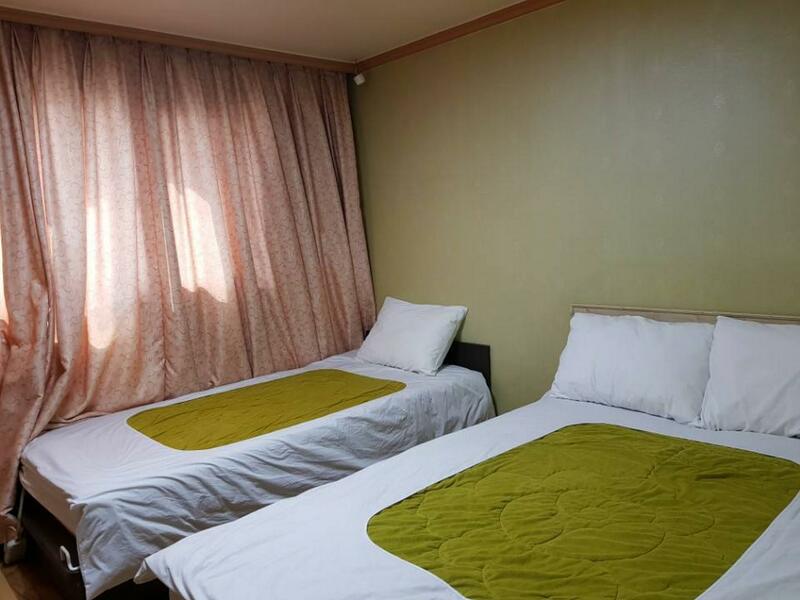 Green and Blue Hotel is a smart choice for travelers to Pyeongchang-gun, offering a relaxed and hassle-free stay every time. "Clean sheets, clean towels, clean rooms, heated rooms and ba..."
Restaurant and rental shop are located on the 1st floor. The hotel is in a very quiet town 15 mins drive to the Yongpyong ski field. There is a free shuttle bus that runs to and from the ski resort. The hotel is family run and the son Michael speaks perfect English and is very helpful. I hired all my gear from him at a price much better than I would get at Yongpyong Resort. Michael also gave me generous discounts on lift passes and dropped me at the ski field every morning. The rooms are warm and clean. I would definitely stay here again. We stayed there for two nights. 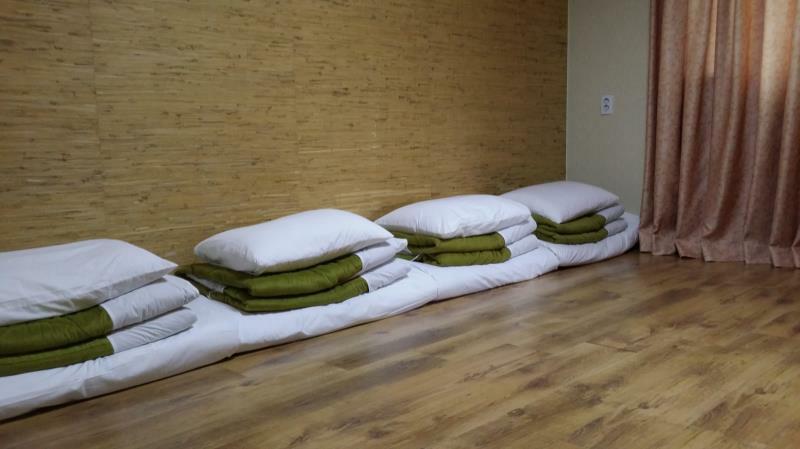 It is very convenient, close to the shops and bus terminal. Also, the shuttle to Yongpyong is only one min walk away. We hired the couch and skiing equipments from the hotel. It is much cheaper than the ski resort. Michael was very patient to teach us. The room is clean and spacious for its price. We can comfortably open one big suitcase and still have plenty of room to move. We will definitely come back if we go skiing in the area again. Hotel is run by a family. Stay here and save money for the skiing. Hotel has a ski shop too where the son runs it. He is a ski instructor and is very helpful in giving advise on where to ski based on your level. He also has good contacts. He gave us 55% discount on the ski lift tickets at Alpensia, 35% for YP, since we stayed at the hotel and rented equipment from him. His rental prices are also lower than those charged at the ski resort. He is generous with advise and instructions on how to improve your skiing and he speaks really good English since he graduated from overseas. The hotel is a bit old but everything works. Clean sheets, clean towels, clean rooms, heated rooms and bathrooms. Walk to some good eating places nearby. Near the bus interchange for YongPyong and only a short taxi ride (about 8-9000 won) to Alpensia. The family tries to make everyone feel welcome, this is not one of those impersonal hotel chain. I recommend this place. This is an older Hotel that is in a great location. Close to restaurants stores and bus transit. Staff were fabulous...even offered to do the laundry for us. Had all the supplies we needed and was very affordable. Family run, friendly and accommodating staff, english-speaking. Our room was quiet, clean, warm, private bath, and cleaned daily/fresh linens. We liked having a hot pot, coffee selection, and a refrigerator in our room. The grocery store next door was convenient. The location couldn't have been better, just a few minutes from everything. Bus and taxi stand right by, under 5 minutes to middle of town, etc. Breakfast included many selections, Western and Korean. The staff was friendly and personable and went out of their way to provide whatever we needed. This is what makes Green and Blue so nice, the interaction with small business owners who really care about their hotel. Keep your expectations reasonable and you will be pleasantly surprised. The hotel was very central and transport to the slopes and Olympic events was fantastic. The owners of the hotel were so accommodating especially the son Micheal who spoke very good English! Would highly recommend! Breakfast was simple but delicious. I reached there at 5:00 am in the morning and the temperature was -18. We were not even offered a place keep us warm. At the end, we resorted to a near by 7-evelen and the lady at the 7-evelen was kind enough for us to stay there for about 2 hours. Went there during year end of 2016. The hotel was near the bus terminal that we arrived via the bus from seoul. Nearby there is a supermarket that we could do some purchases. Location of the hotel is superb for budget skiers. Lady owner could speak English and was very hospitable. Helped us with reserving seats with a nearby BBQ restaurant and helped and advised us with visiting the ski resort and our trip after departing. "Its our first time and we were clueless." Downside on the trip, rooms were a little old, especially the toilet. Felt that the bed were not that clean. Could improve on that. Was charged for a goggle for the day but did not took it with us, owner's son realized it upon returning,and he just said ok, no money was refunded. We did not pursue further as it was late, however, we were a little disappointed by the dishonesty. Nevertheless, I will still recommend this hotel for this who is looking to spend most of the time in the ski resort and just need a place to stay, feeling like home. Julie, together with her husband and son, managed this hotel. Despite the cold winter, my family fully embraced the warmth and kindness that they emitted to us. It was a short but very pleasant, and hospitable stay. We were indeed thankful to Julie for assisting with booking of a ski coach for my children immediately upon our arrival during this high season. Breakfast, though simple, was home made by Julie and delicious. Facilities may be simple but we are not lacking. My younger boy commanded that it was his favourite hotel! Nice small room, but the hotel still under renovation so a bit dusty outsite the room. Breakfast okey, good location. Perfect location, great discounts for ski equipment and accessories. Hotel facilities were definitely not the best. But the location and cheap rental of ski equipment, ski passes etc make up for it. We had the best stay at the Green and Blue hotel. The staff are fantastic and speak perfect English. They went above and beyond to help us numerous occasions. The hotel is located about a ten minute drive from the ski resort and there are numerous shuttles/taxis to take you up there. The hotel was great and the breakfast was also very nice. The owners also have a rental shop which is much cheaper than renting up at the resort. They also provide discounted tickets for the ski lifts. Overall this was a fantastic experience and I am looking forward to our next visit. The family that runs the hotel is extremely helpful and friendly, English-speakers. Location within a block of Hoenggye bus terminal and ski shuttle bus stop. On-site ski shop with 35% discounted lift-tickets and rental. TV had good number of children's channels.